Epsom Salt : Have you ever seen those foot detoxifier ads on television? Then save your money and instead soak your feet in warm water and Epsom salt to get the same effect. It can also help in a full bath and is even useful for treating sciatica. Tumeric : Part of the ginger family, it can be used for a variety of home remedies. Ailments treated include allergies, obesity, Alzheimer’s, in certain cancers, and more. Sea Salt : Have trouble falling asleep? Pour a little of this into a glass of drinking water and it just may help you fall asleep and stay that way. Horseradish : Anyone with a case of congestion knows that a dose of horseradish can instantly help. However, you can also apply it to acne and melasma for a natural remedy. Pepper : Not only does black pepper help your food taste better, it also has other benefits. The stimulation of hydrochloric acid it stimulates can help improve digestion and reduce gas. Oregano : Did you know that one teaspoon of this spice has as much antioxidants as three cups of broccoli? Simply add a little to pizza, pastas, sandwiches, and more to experience its benefits. Dried Red Peppers : These can include cayenne, paprika, and others. The spices help stimulate digestion and burn fat. Rosemary : This small green spice has been shown to help in heart health. It also helps reduce inflammation that can trigger many diseases. Thyme : Similar to oregano, this spice is also high in antioxidants. Studies are also looking into its benefits against respiratory functions. Curry : Have heart problems? Then you might have the remedy in your home’s spice rack. Made from turmeric, it contains many of the same benefits, along with help against heart disease. Sometimes found inter-cropped with corn and wheat in the Midwest United States, common burdock grows wild and vies for the sun and nutrients of the soil. Though routinely overlooked as a native weed, it nevertheless has the potential to gift the bearer greater health and ease skin afflictions when harvested for its root. In the herbal world, burdock is unsurpassed as a blood purifier. It is also the “king” of herbs in treating chronic skin problems such as eczema, acne, psoriasis, boils, syphilitic sores, and canker sores. Make a medicinal tea by bringing 1 quart of water to a boil. Reduce heat. Add 4 teaspoons cut, dried burdock root. Cover and simmer for 7 minutes. Remove from heat and let steep for 2 hours. Drink a minimum of 2 cups a day on an empty stomach, or more if problem persists. This concoction can also be made in a larger quantity and used topically to wash affected skin areas as needed. Mixed with catnip and made into a tea, burdock root is effective in clearing up stubborn kidney and gallstones. Bring 4 cups of water to a boil. Add 2 tablespoons of chopped or cut fresh or dried burdock root. Reduce heat and simmer 10 minutes. Remove from heat. Add 3 teaspoons chopped or cut fresh or dried catnip leaf, and let steep for 1 ½ hours, then strain. 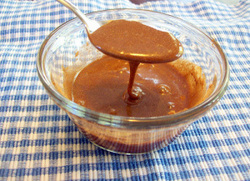 For each cup, add 1 teaspoon lemon juice and ½ teaspoon pure maple syrup or blackstrap molasses (to sweeten). Drink slowly. Follow with 1 tablespoon of pure virgin olive oil 10 minutes later. Repeat this regimen 3 times a day. The tea helps to sooth irritated tissues, and helps break up or partially dissolve the stones. The olive oil acts as a lubricant to expel them from the body more easily. Important to the success of this remedy; digest no greasy, fried foods, soft drinks, refined carbohydrates (such as white flour or white sugar products), red meat, or poultry during the course of this treatment. Well-known lecturer, author and medical anthropologist, John Heinerman, Ph. D., of Salt Lake City, Utah, recommends the following: take the last cup of tea and spoonful of oil at night before retiring. Sleep on the right side, and prop a pillow under the armpit. Heinerman says this posture seems to expedite the removal of the stones from the body. Cayenne is beneficial for circulation and stomach ailments. In fact, many of the herbs used for culinary purposes are not only great flavor enhancers, but medicinal as well. Cabbage has been shown effective in the fight against duodenal ulcers, and is a good source of calcium for those who must avoid dairy products. Radish is helpful for gall-bladder and liver ailments. Sometimes found inter-cropped with corn and wheat in the Midwest United States, common burdock grows wild and vies for the sun and nutrients of the soil. Though routinely overlooked as a native weed, it nevertheless has the potential to gift the bearer greater health and ease skin afflictions when harvested for its root. In the herbal world, burdock is unsurpassed as a blood purifier. It is also the “king” of herbs in treating chronic skin problems such as eczema, acne, psoriasis, boils, syphilitic sores, and canker sores. Make a medicinal tea by bringing 1 quart of water to a boil. Reduce heat. Add 4 teaspoons cut, dried burdock root. Cover and simmer for 7 minutes. Remove from heat and let steep for 2 hours. Drink a minimum of 2 cups a day on an empty stomach, or more if problem persists. This concoction can also be made in a larger quantity and used topically to wash affected skin areas as needed. Besides an aid in clearing problem skin when combined with burdock, red clover is also famous as an alternative cancer treatment, and is a natural blood thinner. In addition, Britain’s licensed medical herbalist, Dr. David Potterton noted that the high insulin content in dandelion root makes it a good sugar substitute for persons who suffer from diabetes mellitus. Many herbs have medicinal properties. Garlic is an excellent natural antibiotic, and immune system builder. Celery juice is a natural diuretic and useful for persons with rheumatism or for those who want to lose weight. Spinach improves the hemoglobin of the blood. Beets are excellent for certain conditions of the liver, and for improving blood hemoglobin. Honey and Cinnamon Remedy has been around for centuries and is good for all types of ailments.